Wow. I’ve been lurking here for years and I just had to post to say that you’re a freaking master. I almost got teary-eyed looking at this piece of work. Nothing has ever done that to me. Amazing. Thanks. You asked for some breakdowns. I based on reference photo quite precisely but to make the [b]frame[/b] more interesting, I decided to add few details like row of chairs in the foreground and the piano with music sheet at the corner of the hall (thanks for advice, mates from Evermotion!). Below you can see examples of [b]models[/b] used in scene: I exported most of ornaments on walls and ceiling to vrayproxy and made instances. I also segregated them into separate layers to keep order and make viewport react quicker. As I mentioned in my previous post, some models were prepared in ZBrush. Most of [b]shaders[/b] are quite simple, I used almost only standard VRayMats with diffuse, reflection and bump/normal maps. The biggest challenge here were chandeliers' crystals and parquet - I wanted it to look noteworthy and with no visible texture seems. The[b] lighting[/b] is even more simple: as the main light I used VRaySun with custom sky map. Additional lights are arranged around chandeliers and one more behind af half-open door. The scene was [b]rendered[/b] in VRay, in Gamma 2.2. The best fun was [b]post-production[/b], when I added chandeliers' bulbs and some bloom and color correction. Jerusha, michaelawesome - thank you very much :) I'm really happy you like it! thats amazing. what are you working on next? a luxury hall, nice rendering, like it. As seen, the black painted wood gives very dark reflections. Also use the Fresnel options of your engine. Because different angles does not reflect in the same way. As for the scenario does not know which picture I like better, the real or CG: It’s great. I’ve chosen the glossy one, cause I thing it suits such rich and ornamental interior better. Of course I did used fresnel reflection with quite high IOR value: 2. In my view, be considered “professional photos” is not the best to get a good realism. Do not forget that the company StockFresh take pictures and edit, something very common in publicity photos, for example in this picture you can see an increase of exposure and brightness added digitally. Be very discrete about has to be dark or light in a changed image to be real and convincing. As this image of the same company, you do not know if a photo or created with Realflow with a rendering engine, no doubt the image was retouched (can be digital retouching or just ambient lighting usually false) so it is difficult or impossible to know whether real or CG. Anyway, the “error” is in any render engine, let it be unbiased or biased. 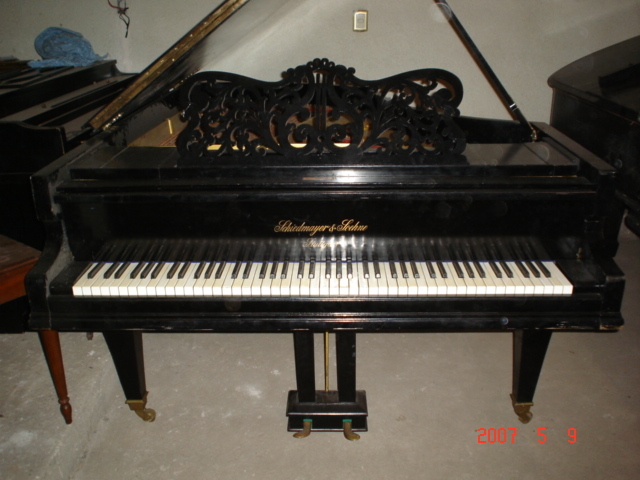 I took the time to ask without having an “eye-CG” also said it is not real, very fake piano. What I say is just to comment on an advanced level to which you have, maybe I’m wrong but I’m just saying what I said to my eye. greetings and congratulations on being in the gallery, however my only criticism is to go beyond. I was curious what is the score that you have added to the piano? really nice modelling, and nice shaders and texturing! Amazing stuff! the whole composition is spot on !! nice work man !! nice lighting and glass shaders. the only thing i dont like so much, are the chairbacks sticking inside the pillows. but the chandeliers are awsome!